04.28.07 Fourteen players turned out for the Friday Night G/35 tournament at The University of Maine, Orono on April 27, 2007. 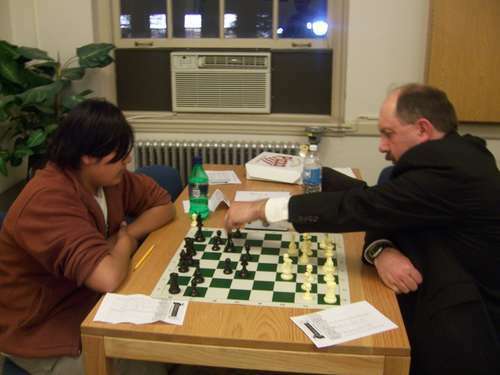 This was the first in a series of Friday night tournaments organized and directed by ChessMaine.net. The three-round G/35 format was planned to give players an option other than the well-trodden full-day or full-weekend tournament. 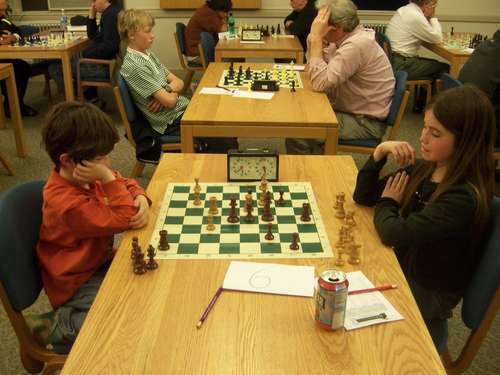 The Friday Night G35 was contested in two sections: Section 1 was won by Ed Hatch with a perfect 3.0 points and Section 2 was also won by a player who scored 3.0 points, Orono Middle School student, Avery Cole. 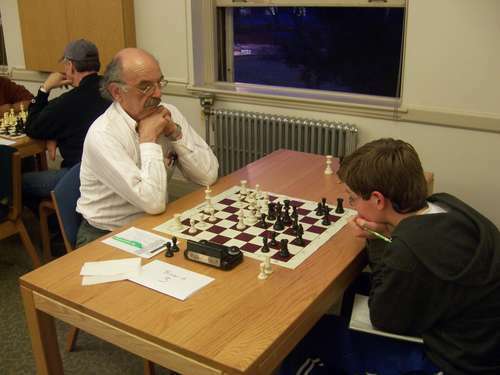 Ed Hatch (right) makes a move vs Gabe Borland in the final round of the Friday Night G/35 tournament at the University of Maine, Orono on April 27, 2007. As the rain fell on the University of Maine's Memorial Union, twenty-one games were played in the Future Farmers of America (FFA) Room in just under four hours. In Section 1, Gabe Borland got off to a suprising start with a win over top-rated Tom Sandford. In a close and tense position Sandford overstepped the time limit and lost. In Round 2, Borland went on to defeat J. Paul Ciarrochi to set the stage for the championship game with Ed Hatch who also had 2 points after Round 2. In an interesting positional game Hatch slowly put the squeeze on, won a minor piece and netted the full point to win the section and $40. In Section 2, Avery Cole and Haley DeLuca Lowell came out of the gate running with two wins each in two games. Another very interesting struggle ensued in their final round game. After a variety of tactical opportunities--some missed and some capitalized on--Cole had the advantage of two pawns to one. Missing a chance to equalize very late in the game, DeLuca Lowell allowed Cole's passed pawn to queen and that was all she wrote. Avery Cole took home $30 for his fine performance. 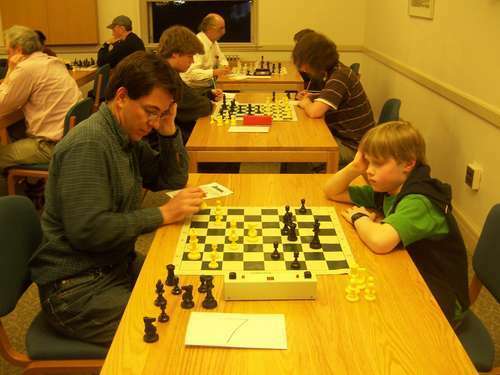 It's our hope that these quicker time control tournaments will encourage those players who are reluctant to invest a whole day in the tournament room to play more chess. Time will tell. Hope to see you at the next Friday Night G/35. The tournament was directed by Dan DeLuca. Avery Cole (left) plays Zach Smith In Round 2. Both of these players are just back from the National High School Championship in Kansas City, Missouri. Dan Robbins (right) tied for second place with Gabe Borland in Section 1. J. Paul Ciarrochi (right) could not contain Gabe Borland in this second round match up. Haley DeLuca Lowell here playing her brother Max tied for second in Section 2 with Zach Smith. 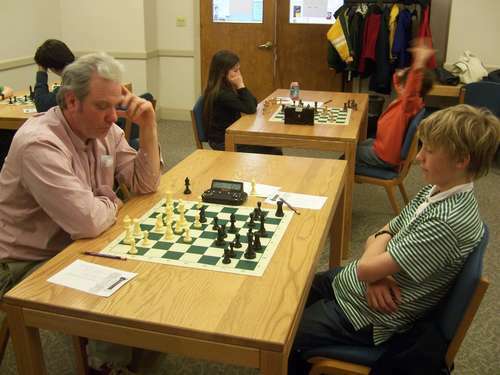 Andy Bryan (left) takes on Nicolai Renedo in a game that went down to the wire. Bryan won with 49 seconds remaining on his clock. 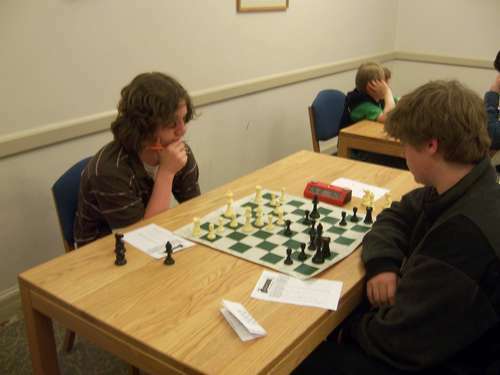 Tom Sandford (left) got a win in this game vs Paul Rudnicki. Ed Rudnicki plays John Kenneway in Round 2.